When Paris, Provence food expert Patricia Wells raves about an American cookbook, I pay attention. The same with food historian Laura Shapiro, who wrote Julia Child’s biography. 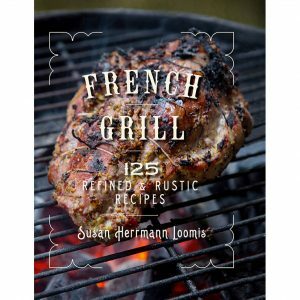 Devoting an entire cookbook to grilling decidedly French recipes is a genius idea brought to life by Susan Herrmann Loomis in French Grill: 125 Refined and Rustic Recipes. Think: Camembert Burgers, Grilled Chicken Livers and Onions on Skewers, Smokey French-Style Gazpacho, Salmon with Tarragon Butter. There’s even a—wait for it—Flourless Chocolate Cake on the Grill. Susan has written for all the major food publications and runs her own cooking school out of a 12th Century convent in Louviers, Normandy, France. (Yes, it’s as wonderful as it sounds). Can’t make it to France to attend classes? Grab the book, in that case. Learn how to cook with a French accent from a woman who embraces all things French—and delicious.